So What Did Great Great Grandfather George Brayley Fox Keep In His Barns In 1892? Here we were then staying in the ancestral Callow barns and in the greatest comfort, each day looking out on the fields farmed by four generations of our Fox family, and wondering what it must have been like to have lived a life in these remote uplands above the Hope Valley, to have worked this land in all weathers. 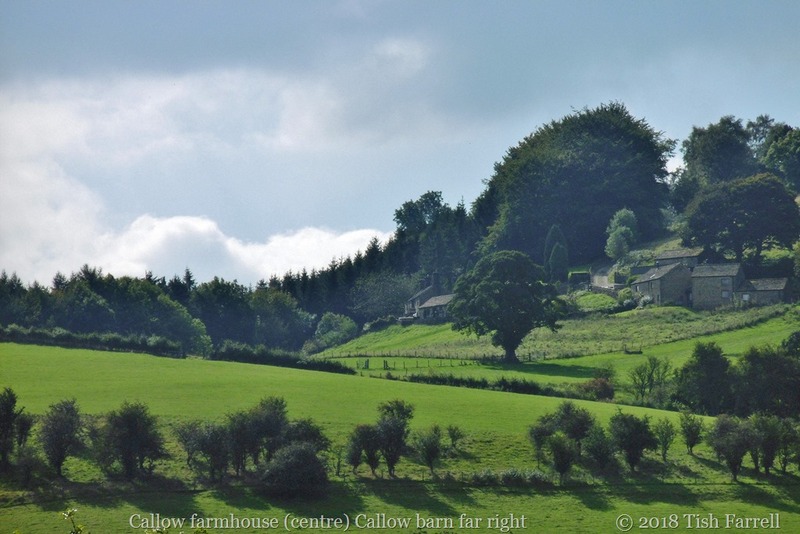 The name Callow perhaps says it all – deemed to mean cold or bare hill in Old English. A hard life then, and especially for the women who mostly died in their forties and fifties after giving birth over and over. By contrast the Fox men tended to be long lived 2x, 4x and 5x-great-grandfathers all lasted into their eighties, and George Brayley’s grandfather, George, was 93 when he died. Tough old birds the lot of them, and some of them prone to a bit of competitive fist fighting, a pursuit that was illegal but much favoured and therefore well supported by the gentry. In the last post I said that many of Derbyshire’s yeomen farmers were also much involved in lead mining and processing. This dangerous trade could make your fortune or kill you. The Barmote Court that regulated the industry’s practices was an ancient institution going back to 1288 when 115 square miles of Derbyshire’s High and Low Peak was established as the King’s Field, a free mining area. Surprisingly the construct pertains today, the last surviving Barmote Court still meeting at Wirksworth once a year. Anybody was allowed to set up as a miner and work by very liberal rules permitting them to search for lead ore anywhere but in churchyards, gardens, orchards and highways. The miners had right of access, water and space to mine and dump their waste without regard. They did however have to pay a royalty on all ore mined, of one thirteenth to the Crown( known as a lot ) and one tenth or tithe to the Church. In other words, the lead miners were likely to be tough, free-booting individuals and, although answerable to the Barmote Court in the staking and working of their claims, their pursuit of lead gave them the chance to break free from feudal obligations as tenant farmers and manorial employees. One 16th century yeoman, Arthur Mower, also bailiff to the Lord of the Manor of Barlow, became so rich from lead mining and exporting he soon outclassed his lordship in terms of wealth and property. Not so the Foxes, at least not the Callow clan. But then George Brayley Fox did have quarry tools in his barn. And many more things besides. The 1891 census shows that George is seventy years old and a widower. He is living at Callow with his son George (22 years) and daughter Louisa (25 years). His 9 year old step-grandchild from Farnsworth, Bolton in Manchester is also staying there at the time of the census, and this may be a clue as to the real reason why George B had announced his intention to sell up by the following year. Giving up the tenancy of the farm where he was born must have been a wrench. 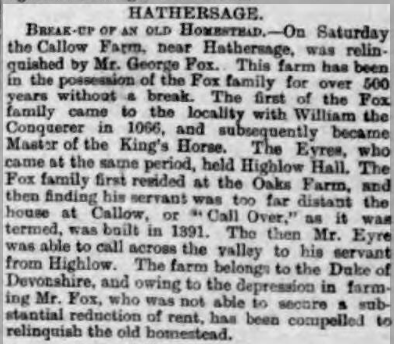 It was certainly newsworthy, and reports of the Fox family finally leaving Callow were published in regional newspapers as far away as Leeds. The reports made much of the family’s connection with Callow’s environs since Norman Conquest days, a claim that was part of the Fox family narrative, much repeated down the generations, but so far lacking verifiable substance. The report below also says that the reason for selling up was due to the high rent, which was very much a common complaint of Derbyshire farmers at this time. But I still wonder if this was the chief reason, or the one meant for public consumption. On Saturday 29 October 1892 the Sheffield & Rotherham Independent newspaper listed items in the upcoming Callow Farm sale. It is a vivid snapshot of life on the farm, and the picture it gives is of a well-managed enterprise using up-to-date technology, not of a farm that is failing. Much of the equipment is stated to be new, and the livestock of good quality. First there are the horses – a black mare in foal, and an ‘excellent worker’; a valuable six-year old brown horse with ‘splendid action’; a roan foal by Bedford. There are 23 cows including 5 strong bullocks, a cow in calf for 25th December, and 4 cows due to calf in April. Then there are ‘11 superior stock ewes, 6 fat sheep, one two-shear ram, 12 strong lambs’. Finally in the farmyard there are ‘two fine ducks and one fine drake’. And now for the barn contents. 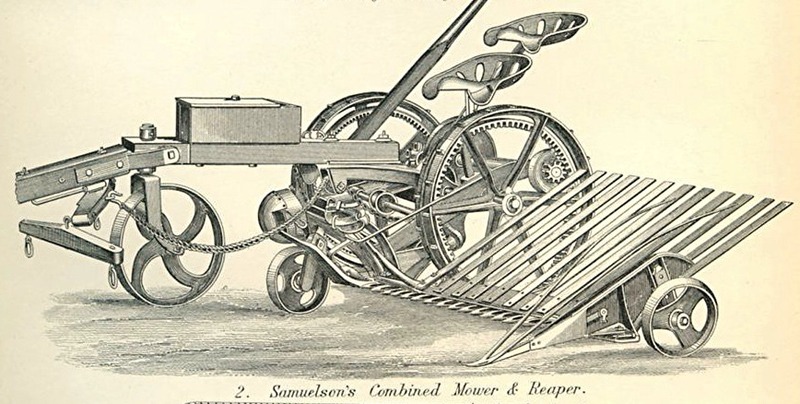 These included some pretty high-tech (not to say cutting edge) gear of the day, including a nearly new Samuelson 2-horse combined mower-reaper complete with spare shafts. This was the sort of pioneering equipment that was shown off at national trade exhibitions of the day, produced by the Britannia Works, Banbury. There was also a plough, several sets of harrows, a stone roller, a horse turnip hoe, 2 horse carts, a winnowing machine, a joiner’s bench and tools. Then there are clues as to what the farm was producing. 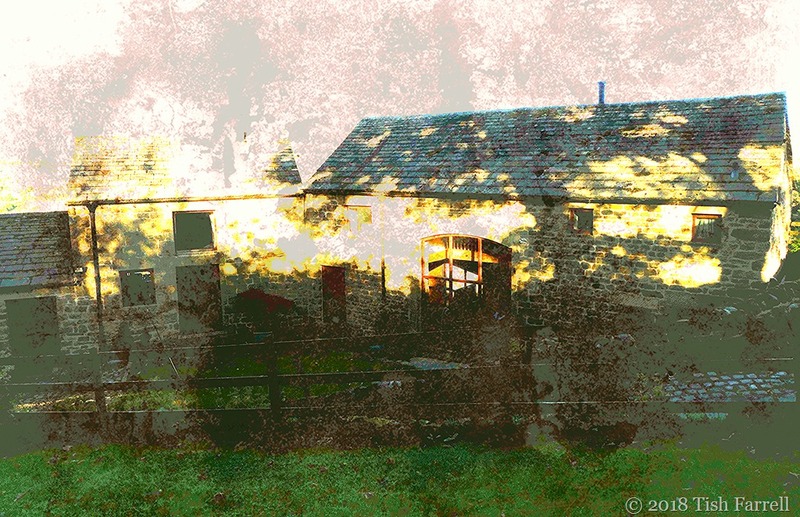 There is a stone cheese press, rack and boards (nearly new), five stacks of white oats, three stacks of wheat, two brewing tubs, a quantity of eating turnips – all of which reflect the standard staple diet of Derbyshire farming folk. For the animals there was one stack of ‘prime new hay’ and two stacks of black oats – probably horse fare. The whole lot up for auction at 12 noon on the 3rd November 1892. 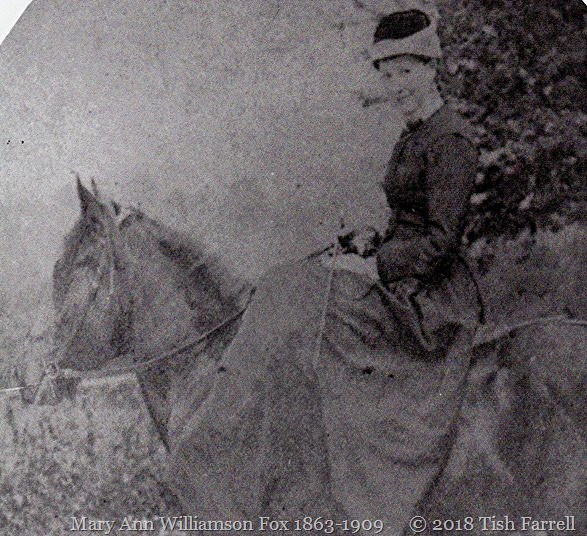 And the reason for the sale – well my big guess is that it has much more to do with his eldest daughter, my Great Grandmother, Mary Ann Williamson Fox. According to my aunt she was engaged to the Squire of Abney (just over the hill from Callow), but at the age of 22 she ran off and married a young widower, a shuttle and flyer manufacturer from Farnsworth, Bolton. And not very long after that, it was all downhill for the last generation of Callow Foxes. But that story will have to wait for another time. 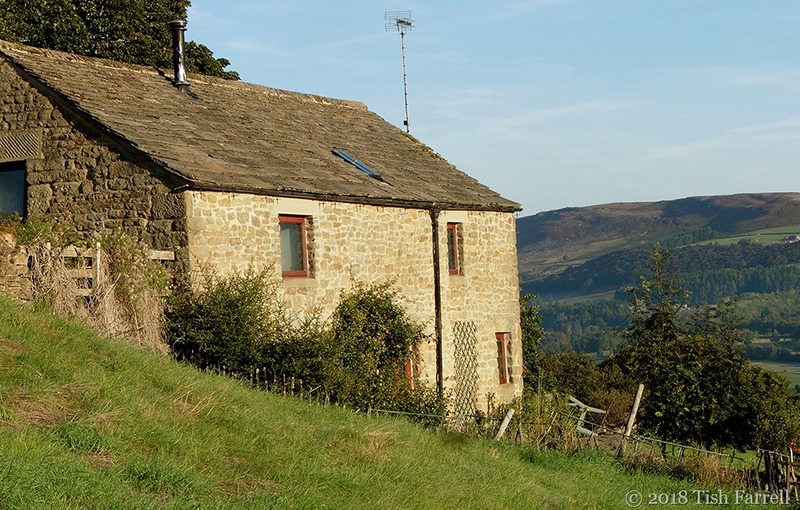 Posted on October 8, 2018 October 12, 2018 by Tish Farrell	This entry was posted in Family History, Heritage and tagged #AncestralLandscapes, Callow, Callow Farm, Derbyshire, George Brayley Fox, lead mining, Tish Farrell Writer. Bookmark the permalink. Lead mining sounds like “Dangerous Sport” to me! It was, Thom! Quite apart from the toxins, some lead deposits were prone to explode when subjected to a bit of hammering. Many thanks for those kind thoughts, Brian. Went and visited Little John while we were there. The farm looks directly down on the church spire. It’s a fascinating part of the world. No indeed. Was once driving over Snake Pass in a blizzard. It was hair-raising. Callow is quite a common place name up and down the UK. In fact there are two separate Callows in Hathersage alone where the ancestors were – almost looking at each other across the River Derwent. It is hard to imagine that lead mining was taking place in this beautiful pastoral region. Also I was thinking of the hardy men who were doing the mining. They perhaps had no idea how poisonous this metal was that they were mining. I am looking forward to reading the rest of the story. Best wishes, Tish! Some of the mines were only accessible by ladders down into 90 foot shafts, and so quite a few miners lost their lives falling down them. There was death from lead dust, flooded chambers and roof collapses. Earliest mining seems to have been more opencast, quarrying seams along outcrops. Only when these ran out did the deep mining take over. Either way, the lead bearing rock had to be dressed and washed then carted to smelting houses – somewhere where there was plenty of timber for fuel and some strong breezes. Then the resulting lead had to trundled up and down the hills to the nearby city of Sheffield and beyond. In the early days before the turnpikes of the 1730s onwards, most of the transport in the area would have been by packhorse. It was indeed a very tough way to earn a living. And certainly by the 17th century, local people were at least aware that there were ill effects to plants and animals from lead miners washing their rocks in water courses. There were apparently some fierce disputes between miners and farmers. Thank you so much for the detailed information, Tish! It is very much appreciated. Have a good day! What an interesting story, a colorful glimpse into the past! It is great that you have been able to gather all this information about the lives (and property) of those before you. It’s amazing how much you can pick up from the internet – especially from the old newspapers now on line. Thank you, Sue. And no, I’m sure they didn’t know how poisonous lead was. I need to look into it a bit more. Yes the lead mining at Snailbeach in Shropshire was quite a huge operation for a time. And I’ve just read that people did know that it poisoned plants and animals. Sounds like a pretty nice farm, even today. And in a lot of places in the world, those are STILL high tech tools! That’s a very good point re the tools! Such a rich post Tish; family and social history interwoven as I think it should be. I’m struck by the (wholly understandable) pattern of the menfolk outliving their wives. That’s the complete opposite of my lot. The women still seemed to bear a child a year for well over a decade, but managed to — generally — significantly outlive their spouses. I shall have go off and investigate life-expectancy by region and occupation. Lovely comment, thank you, Su. Also the life expectancy issue is an interesting one. George B’s wife was 17 years younger than he was, and 52 when she died. All but one of her 5 children lived to around 70, the eldest son, the others also died young, in their 40s, but then they followed Mary Ann to the city. Mining of all sorts tended/tends to be difficult and dangerous and often with harmful side effects of one sort or another. Farming isn’t an easy life, either, so the two together took tough people. The countryside is beautiful and the history, as usual, fascinating. Yes farming and mining definitely call for robust constitutions and dogged determination. Thanks for those thoughts, Janet. It must’ve been a heart wrenching decision to sell such a seemingly prosperous and well run farm. Did you find out where the family moved too and what they did next? It’s quite a hard one, isn’t it – envisaging how industrial this countryside must once have been. Lead smelting would have been particularly noxious. Also today’s scenic villages would have been industrial workshops: wire pulling, needle and button making, silk weaving and shoe making. And then there were men working up on the bleak gritstone edges, quarrying and making millstones and grinding stones – the latter for the cutlery industry in nearby Sheffield – hauling them by cart and packhorse. And as for the lead, I think I read that nearly half the rural population was involved one way and another during the 17th century. So interesting, Tish. Quite a picture to envision. What a good historical story. Glad this hits the spot, Pete. Riveting reading, Tish – I do hope you don’t keep us waiting too long for the next installment! Fascinating stuff, Tish. Wonderful to unravel a piece of your story! Fascinating story. Love to hear more. It was an excellent trip, thanks, Jo. Saw lots of amazing vistas, and nearly died climbing up to to the keep in Peveril castle in Castleton – Phew! I won’t be doing that again. Fantabulous views across Derbyshire though. Go Mary-Ann. I like a woman who knows her own mind!